Shvat is the eleventh of the twelve months of the Jewish calendar. We often refer to Tishrei as Rosh HaShanah, the head of the year, the New Year. However, it is not the first month on our calendar, as it is in other calendars. The first month in the Hebrew calendar is the spring month of Nisan, when Pesah appears. The fifteenth day of Shvat, Tu B’Shvat is called the “New Year of Trees.” The “New Year of Trees” is the day from which the new year was reckoned (and still is in Israel) for the fruit of the trees with regard to the mitzvah of ‘ma’aser’ the tithe or tax that was given to the Temple, the government and the poor. Traditionally, we celebrate Tu B’Shvat (the 15th of Shevat) eating fruit, especially of the seven species which grow in the land of Israel is blessed. The 15th day of the 11th month alludes to G’s ineffable Name: Yod and Hey and Vahv and another Hey. The first two letters, Yod and Hey are often referred to as the upper level (also called the hidden level), the Heavenly Realm, and equal 15. The last two letters, Vahv and Hey refer to the lower level or revealed level, the Earthly Realm, and equal 11. 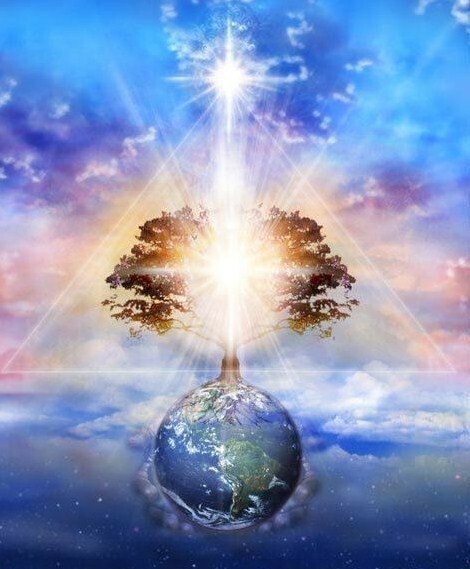 The mystical view of the Tree of Life is that of uniting heaven and earth. The four letter name of G, also called the Tetragrammaton, is associated with the mystical view of the “Tree of Life,” and so is associated with the month of Shvat. Shvat therefore is the month of unification of the upper and lower realm. Put differently, this month represents, in Kabbalah, the opportunity of bringing heaven and earth together. The Letter for this month is Tzadi. The letter Tzadi represents the word Tzadik which means righteous one. Tradition teaches us that there are 36 anonymous, perfectly righteous people in the world and through them the balance of the world is maintained. The shape of the final Tzadi (ץ) can be seen as a tree. The month of Shevat is the month of sacred inter-connection. The Mazal (zodiac sign) for the month is Aquarius, the water bearer. In Israel, around this time, the first buds begin to see light. The rain has brought life to the earth and the water nourishes the roots of the tree. The buds just begin to appear. What greater sign of hope could be found in nature? The Ba’al Shem Tov said that when one meets a water-carrier carrying pitchers full of water, it is a sign of blessing. Symbolically, a Tzadik is a water carrier. S/he is the one who waters our parched souls. In Amos (5:24) we read, “let judgment run down as waters, and righteousness as a mighty stream.” According to the Rabbis of old, water refers to Torah. There is a famous Drash (expounding) in Talmud (Baba Kamma 17a) that states “Aine mayim elah Torah” which basically calls us to interpret the term “water” as Torah. Therefore the month of Shvat calls us to return to the study of Torah so that we may bud anew. The eating of the fruits of Shvat is symbolic of munching the sweet fruits of Torah. The Tribe assigned to this month is Asher. The name “Asher” means ‘pleasure’ and ‘joy.’ Asher represents the joy of learning the joy of diving into the waters of Torah. Asher personifies the olive tree. Olives were more than food in ancient Israel. They were also the source of light and sacred light. Oil was used in lamps and most especially in the sacred Menorah of the Temple. The story of the miracle of the oil at Hanukah refers to olive oil which was, according to tradition, Asher’s portion in the land of Israel. In addition, anyone anointed for leadership as king, priest, prophet or warrior was anointed with olive oil. The word for anointed is ‘Mashiah’. Of the seven species of the land of Israel, the olive is the sixth. The sixth Sefirah in Kabbalah is Yesod, the foundation for all action. Tzedaka or right action is the foundation of the world. The Tzadik righteousness is the Yesod, the foundation for right action. Olive oil represents the Tzadik who waters us with Torah as we bud in the betterment of this world. The Sense attributed to this month is eating, taste (‘achilah,’ ‘ta’am’).